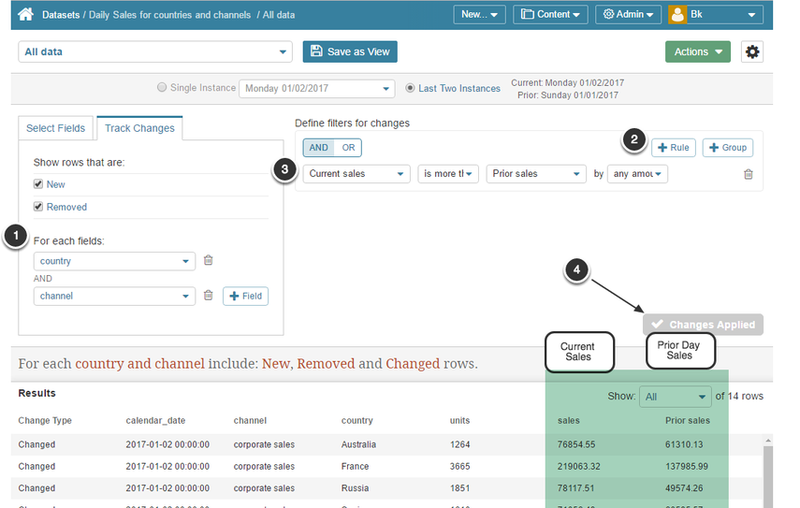 While the Video Tutorial is still valid and useful, newer versions of Metric Insights also allow you to find rows that have been changed in addition to those added or removed. How to compare specific values for current and prior period (for example, compare sales made via a specific channel yesterday and day before yesterday). Tracking changes in the Last Two Instances of this Dataset (for example, yesterday's data compared to what occured the day before yesterday). Example: In the example, we choose the instance collected on Saturday 12/17/2016, meaning that it will automatically be compared to the instance collected prior to it on Friday 12/16/2016. Only those rows where the values defined in Id fields have been changed/added/removed since collecting the prior instance are shown. 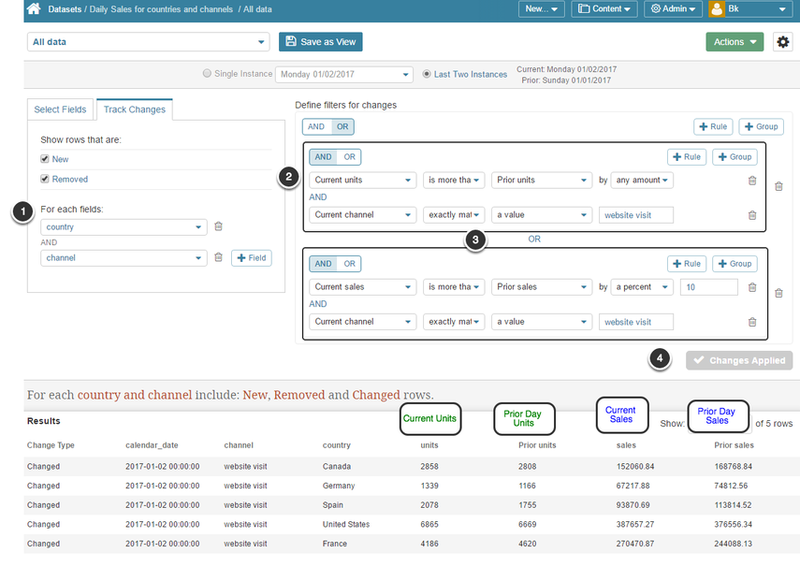 New sales have been made in all countries and by all channels, but values in country and channel columns remained the same; e.g., Country = Australia, canada, France, Germany with Channel = corporate sales, store visit, website visit, e-mail marketing), so the system has no changes to display in the Results set. Define the parameters for comparing current and previous values from the drop-down lists. More rules can be added to the filters. You want the key fields across which changes will be tracked included in the Select Field list. 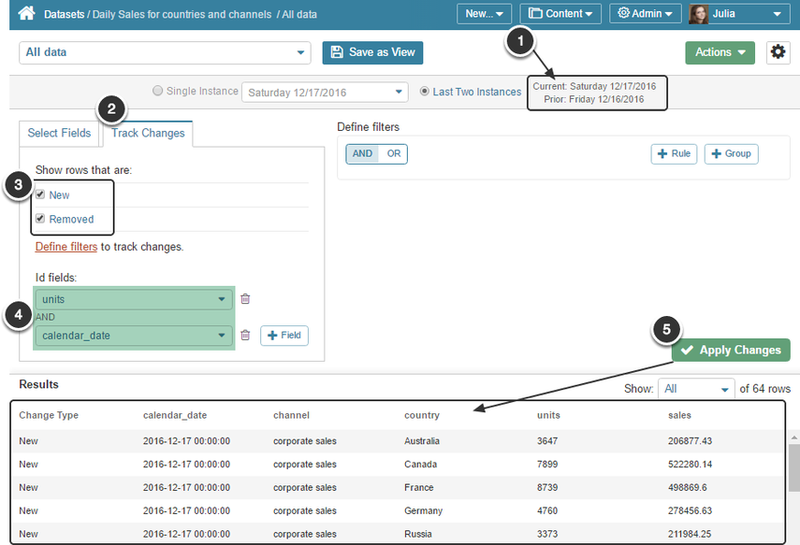 In this example, you should select ONLY Channel, Country, units, and sales for inclusion in the display. 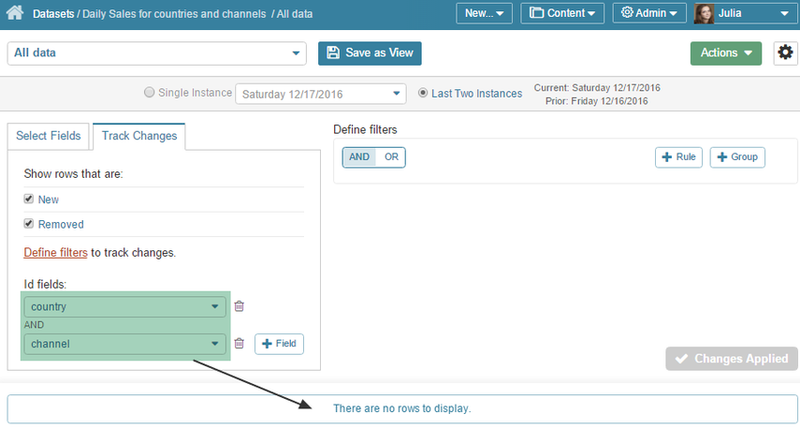 Next: Filter combinations for comparing "Last two Instances"